Have you ever looked forward to an event, only to have your plans crumble? “Life intrudes” we say. Or “God laughs when we make plans.” Responding quickly to change can be difficult. At least it is for me. If you know people of Dutch descent, you will understand. We are not known for our flexibility! We are known for our tenacity, which is also a virtue, but quite a different one. Right now I’m in Grand Rapids, Michigan. I came for the Festival of Faith & Writing at Calvin College, which I’ve been attending every-other-year since 1996. There is no other gathering that I attend with such regularity. FFW pulls together many threads of my life: 1) As a former member of the Christian Reformed denomination, Calvin is my alma mater; 2) As a pastor, I have found lots of fodder for preaching and ministry; 3) As a reader, I have been bathed in words, and the ways that words evoke meaning; 4) As a budding writer, I have met editors, publishers and agents over the years; and 5) I can do all this and simultaneously visit my parents, who moved to Grand Rapids in retirement. In fact, my favorite festival events have been the ones my parents attended with me. In 2006 I even convinced them to register for the whole festival. That was the aerobic FFW. I fondly remember pushing my mother’s wheelchair across campus at high speed — whirring her to one event, then running off to attend a different one myself! 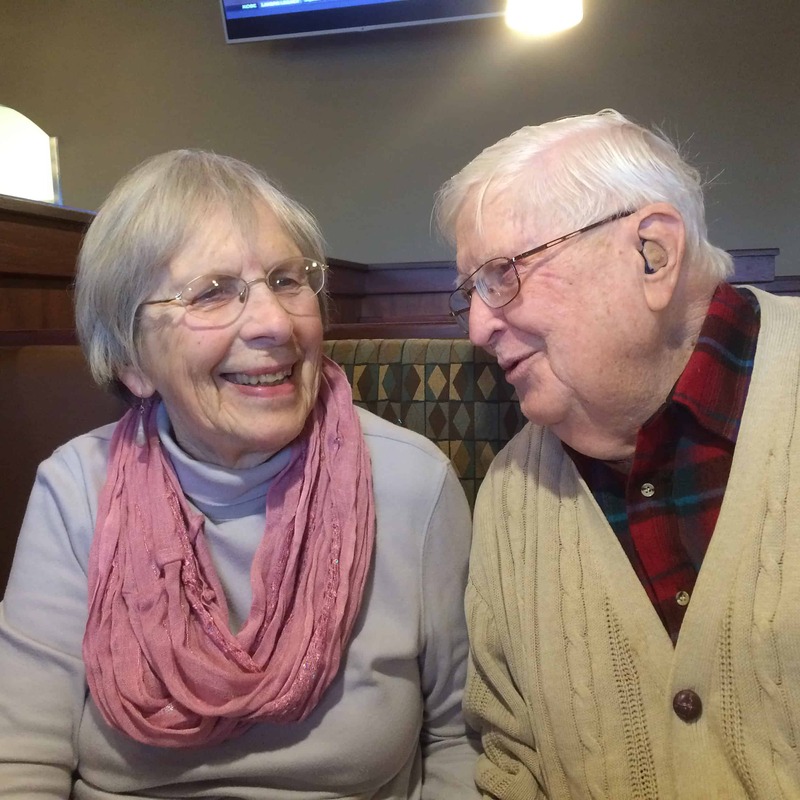 My parents are 87 and 90 now, and the festival events are too difficult for them logistically. The crowds are hard to navigate and they have difficulty hearing. Recently my father has slowed down quite drastically. His breathing has become labored. Months ago I registered for this year’s festival and bought my plane tickets. Then my father’s doctors scheduled an elective heart catheterization right in the middle of FFW. I was concerned about the changes in my father’s health, grateful that I would be in town, and disappointed to miss hearing the authors. How the days worked out has been a gift, a different configuration of the threads of my life. I had already set up a number of appointments related to my books, and was able to honor those. 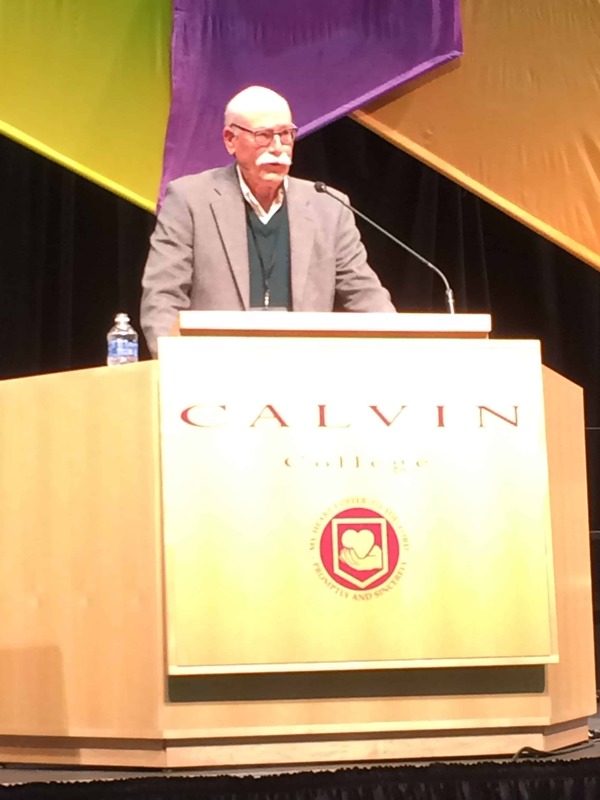 I was even able to attend the opening lecture by Tobias Wolff, whose writing I especially appreciate. On the day of my dad’s heart procedure I was at the hospital with my mother, sister, and niece. The medical care that my father received may be considered “routine,” but it is truly amazing. What a privilege to pray over my father’s bed, hands joined with family members. Today will be a similar patchwork of events, including picking up my father from the hospital and attending a lecture by Nadia Bolz Weber. At least, that is the plan! We shall see what transpires. I’m pausing to write this as I begin another busy day — a day that feels complicated, messy, and beautiful! I know your days often feel the same way. There are unwelcome adjustments, but also unexpected blessings. Perhaps these messy days are when God’s activity becomes most apparent to us — in a swirl of events that the finest planning could not have orchestrated. Breakfast with my parents the day before the cardiac catheterization. Front and center at the Tobias Wolff lecture. One of my blogposts was among the 14 most-read Christian Century blogposts in 2014. Perhaps I should use foul language like “stinkin'” in my titles more often! My thanks to all of you for reading, and to the good folk at CC, especially Celeste Kennel-Shank and Steve Thorngate who curate a tremendous amount of blog material related to church, religion, spirituality, culture. Onward to 2015! Do you write Resolutions or Intentions? Some people scoff at the practice, but each year I choose a phrase to remind me how I intend to live my life in the year ahead. It helps me focus. My 2014 intention was Do the Work. I often muttered this to myself as I sat down to write. It was so helpful that I even renamed this blog, which used to be Work in Progress. I prefer the verb: Do. My 2015 intention is similar: Love the Work. (You might remember that I’m borrowing the phrase from Gordon Lightfoot.) May all of us love our work in the year ahead! Isn’t that one of the secrets of happiness? Work is one way we become ourselves. Want to share your intention for the year ahead? I’d love to hear it. In a casual conversation I said that someone went to the UCC, meaning, of course, the United Church of Christ. This is one thing I love about language: Context is everything. I appreciate a reality check. That’s why my writing groups have been so important to me over the years. They offer support and guidance, but most of all a dose of reality. Have I lost my way in this maze of words? Should I continue to invest energy in this piece of writing? I’m in two writing groups, both of which I helped to found. They serve slightly different purposes in my life, not out of any intentionality but because the women in them are different. Every group develops its own character over time. Linda Cross and I were the charter members of a group we dubbed “Women Who Write” back in 2002. It was exciting to call ourselves WWW because the term was quite novel. The Internet was just becoming mainstream. At the time Linda was writing a novel with a good bit of suspense, and also some romance. I loved her main character, Marty. Before Linda got it finished, or published, she moved away and our group went on without her. Now Linda has published that novel as The Art of Escape. She used CreateSpace to create both Kindle and print editions. I just downloaded it for a mere $4.99. Can’t wait to re-read it and see how Linda shaped Marty’s character, and how the plot morphed over time. I hope you’ll consider buying it for yourself or a friend, and let me know what you think of it! You’ve heard me praise writing groups before. I often talk about the Writing Revs. Here is a post about WWW, as we toast some successes. Let’s raise a glass to writing groups, and to reality checks! If you’re a writer, I suggest you find yourself some other writers, and go the distance with them. What’s your haiku for today? Write three lines: five syllables, seven syllables, five.